It’s a sad irony that within 100 years of the introduction of cement and its complete dominance in new buildings, that the downside should be the destruction of buildings which have stood for hundreds of years; well before cement was invented. Cement is a truly wonderful product, easy to use, forgiving and offering incredible strength it’s not surprising that it’s applied almost everywhere. And so it has been for many lads joining the building trade in the 70’s. One shovel of the grey powder and three of the sand; usually bright yellow builder’s sand, adulterated with finer red sand of exactly the wrong sort for the job – but it was such a pleasure to use. For those that don’t I’ve written this short post to describe in simple terms why cement should be avoided when applying mortar to external surfaces, as either pointing or render and what to use instead. I am not a conservation specialist so here I am referring to ‘old’ buildings – not historic fabric which may need much more careful consideration and consultation with the local conservation officer. By ‘old’ I mean any stone building, even if brand new (remember – stone is always old) and all brick buildings which are pre-war. There are arguments against cement even on new-build, but let’s leave that on one side for now and ask why it matters, particularly on older existing ones. The above image shows destruction of stone on a building in Yorkshire. Look close and you can see that the pointing is standing proud of the stone edges and in effect the stone appears to have almost shrunk away from the pointing; leaving an undercut I could get my fingers in. Think about it; the chap who applied this pointing couldn’t have trowelled that mortar like that; this has happened since the pointing set; against the stone. Is the cement corrosive or something? What’s happening? Well, the first thing to remember is, we live in a wet country; it rains lots. These stones soak some of the rain up and have been since they were hewn from the quarry and put in this building. This getting wet and drying out, is all part of a natural cycle and is not that damaging to the stone. The lime mortar bed joints too, soak up this water, maybe even a bit quicker and they too let the moisture back out as the wind blows and the sun shines. There are buildings like this which have stood for hundreds of years, with little sign of the sort of erosion seen above and then in the middle of the 20th century things changed. The thing is, lime bed joints don’t last forever and the weather takes its toll. Eventually after decades the beds may be badly recessed and water can really get in and cause damage. The answer is re-pointing and many old buildings have been repointed several times with no ill effect; until a few decades ago when the well-meaning builders used the new stuff – cement. Unlike lime it sets fast, can be built up quickly – is less susceptible to frost damage and it retains water better in dry weather – rock hard too, so it lasts so much longer. No wonder the builders chose it – anyone would. So, we have now repointed the old chapel with fancy cement mortar and even used it’s workability to produce a fancy ‘strap’ appearance as below (shudder…). The next week it starts raining and once more the wall soaks up water. Through the stone mainly, because now the beds are sealed up with this dense cement. The wall gets pretty saturated and moisture gets behind the cement via the stone and the tiny cracks which form between hard and soft materials. Some of these cracks are too hard to see with the naked eye but they are there; cement is sometimes so hard that even the act of curing against a soft stone will cause the face of the stone to be pulled away by tension, induced as the cement imperceptibly shrinks. Once the sun comes out drying begins, but now the cycle is altered. Evaporation still happens in the stone, but the water in the bed joints, behind the cement is not wicked away and the beds stay moist for much longer. There are now some subtle additional things to consider; a wet wall is a cold wall because as water evaporates it uses energy. The wall is cold so overall there is less energy to drive evaporation and so the time needed to dry the wall in depth is much longer. Two things lead on from this; it is likely that the wall will be rained on again before complete drying has happened, leading to a wall which is wet for a much longer period. For much of the year it is now never truly dry. Fast forward into winter and that’s when trouble starts. Night falls and ice forms in the surface of the stone, especially around the edges of it next to the bed-joint. Moisture is concentrated here because its pathway out of the wall is blocked by the bead of impenetrable cement, so it is slowly ‘wicked’ around the cement via the adjacent stone. To make matters worse the cement pointing has the strap detail, so it also offers handy little ledges for standing water to dally, allowing even more saturation of the stone. When water freezes it expands; ice cubes are always bigger than when they were poured into trays as water. When this happens inside the stone the very structure of the material is burst apart, leaving the characteristic friable surface seen below – often accompanied by a pile of sand on a windowsill just below that. 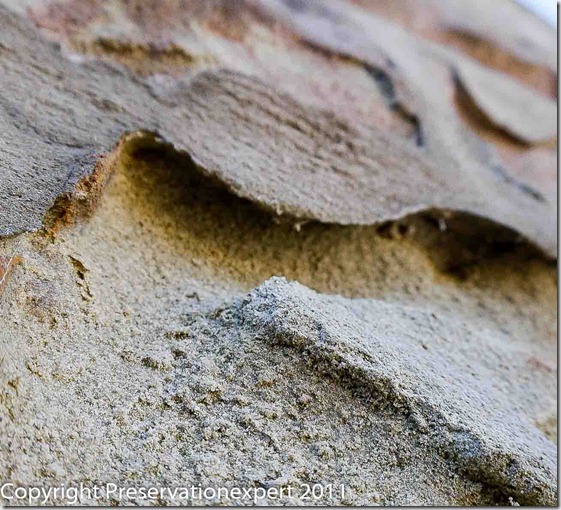 The tiny cracks at the interface between stone and bed ices up and the expansion puts stress equally into the cement bed and the stone…. which is harder? It should of course be the stone, which was the case, before the lime bed was chased out and replaced with rock hard cement. Something has got to give. There are other things going on too, but the big killer is the freeze thaw cycle, which may have been there before the cement was applied, but the new conditions have amplified the problem and accelerated it many times over. The evidence is all over the place and is growing. I’ve seen many buildings where the general condition of the stone is excellent, apart from one area which was cement pointed say 40 to 60 years ago. That is a very short time indeed, especially when you think that actually all stone is millions of years old – why is it suddenly changing back to sand? For all relevant external repairs I specify natural lime mortars. Occasionally we’re using moderately or weakly hydraulic types when it cannot be adequately protected and fat lime is too risky. This type of pointing won’t last forever – nothing can. But as it succumbs to the weather it will sacrifice itself for the good of the building, rather than selfishly hanging on like a parasite, whilst its host withers away. For more information try SPAB (Society for the Preservation of Ancient buildings), who have a huge library of useful stuff and contacts galore on their web site. The use of lime is no longer just the preserve of specialist conservation companies, because frankly there are not enough of them to deal with the epidemic of damage which is in progress now. All builders and maintenance companies should, like I, have themselves and some key staff attend at least a basic ‘lime day’ of the type SPAB organise, so that those healthy stone and old brick buildings awaiting pointing, get the right material and don’t end up looking like those in the above images. If your building is suffering already then the best solution is to remove the cement pointing and replace it with lime. However, this is not always appropriate if the material is so hard that its very removal will cause damage. In these cases and only with specialist advice and careful consideration, the use of a water repellent cream such as Storm Dry may help. This will at least reduce the absorption of rainwater so that less time is needed for evaporation and drying – and the freeze thaw cycle is shorter or negated altogether. A great Sunday morning read !! I will get Dean to read this over too – very interesting. Glad you like it Annabelle and especially if you think it would help Dean and your clients. I agree it can be an uphill battle but I keep trying! Great read Bryan, I have to admit I was as guilty as anybody in my younger days of re pointing like this, but it was just how we were taught back then and I knew no different. These days we know this is no longer how it should be done, but it still happens all the time. Keep up the blogs always interesting and informative. Weren’t we all? Education makes all the difference and to be honest I didn’t really get it until I attended a SPAB lime day a few years back – opened my eyes and I can highly recommend them. Mine was by Mark Womersley from Heckmondwyke – very down to earth and straighforward bloke. I’ve since sent two of my techncians on lime days and plastic stone repair days too and we’ve done quite a bit of work on this over the past three or four years, so it was also good for business. brilliant article – I’ve been researching about all this stuff as my 1890’s house needs repointing. I reckon there is loads of damage already caused by other peoples cement pointing over the last 30-40 years. Now I’ll have to try to fix it all and use lime. I’m told that NHL 3.5 is the correct stuff to use? I’m wondering if all the penetrating damp issues I have in the house could be caused by the cement pointing in the bricks on the rear of the house and the cement pointing on the stone front (my stone fronatge has the ‘strap’ pattern as in your photo). Probably done by the cowboy property developers I bought the house from a couple of years ago!! Should I get the whole house repointed in lime? What do you think? I’m going to print off your post and show it to every builder I meet!! Thanks for teh info – extremely helpful. I am glad you found the article interesting. 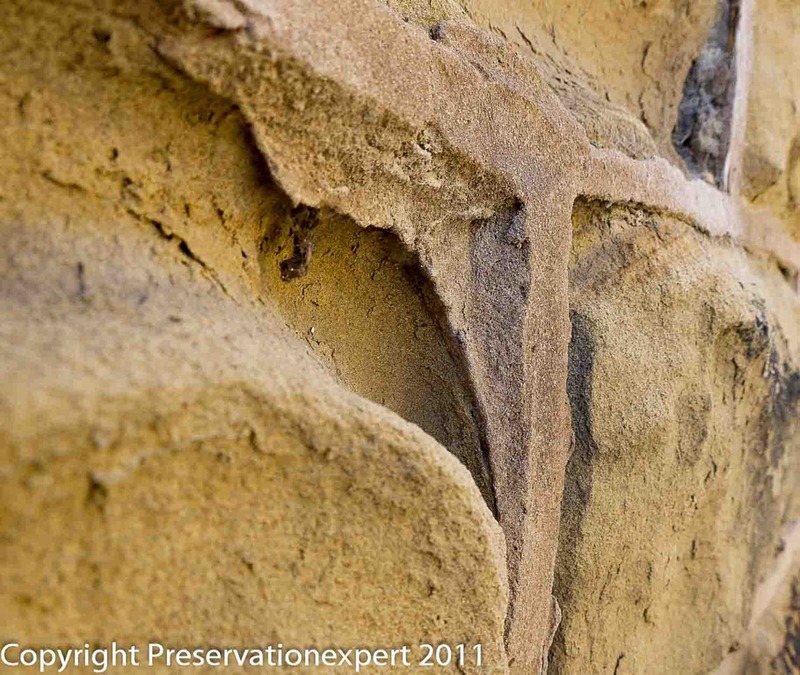 If you are going to use hydraulic lime I would use NHL 2 (or even 1 if you can protect it well during curing) as this is softer and will allow evaporation better than NHL 3.5 A well graded sharp sand is also important, avoid soft sands which have too high a fines content, these will crack and will also trap in moisture. The thing is that all walls absorb water to some extent, the problem with cement pointing is that it traps the water in the wall for longer, accelerating the freeze/thaw damage in winter. 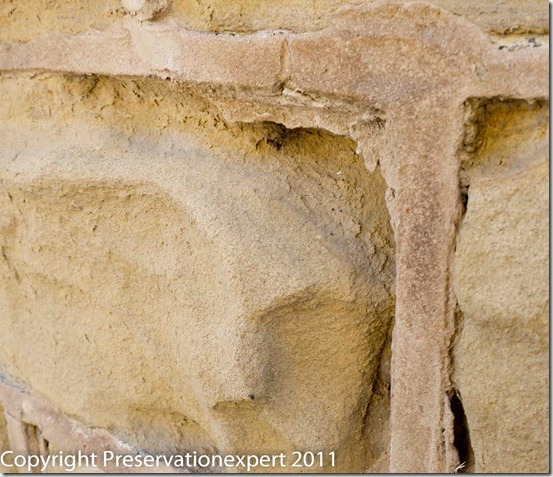 Lime mortar will crack much less, so whilst it is more porous, the wall absorbs less water. The water is also released quickly when the sun shines and the wind blows, unlike cement. Interested to find out how you got on with your stone wall as I have exactly the same problem with my 1900’s built terrace house. 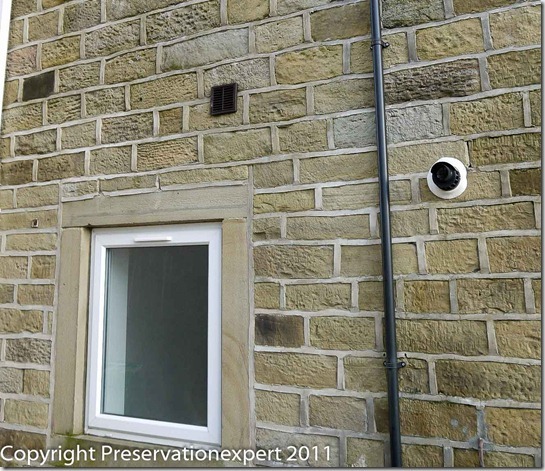 Interestingly enough I had a surveyor, Steve Hartley from ******* Preservation Ltd in Sowerby Bridge pop round and look at my stone wall amongst other things. He concluded exactly the same as this article. Particularly wet were the “through” stones that bridge the outer and inner wall. However I’m having difficulty finding a builder or stone mason who will actually use Lime Mortar… they all want to use cement or at least partial cement to repoint on the outside and recommend using tanking slurry on the inside wall. PS. Thanks for posting Dry Rot. Really useful blog post. I’m surprised you are having trouble finding a builder to use lime. It really isn’t rocket science and just needs handling properly. If you have a good builder ask him to read-up on lime use. As long as he sticks with the fundamentals he should be fine. Where damp is penetrating through a through stone it may be resolved by lime pointing. However if that doesn’t work you could consider application of a good quality water repellent cream like Safeguard’s StormDry product (not for limestone but I expect that will not be the case in Sowerby Bridge). You shouldn’t need a cementitious slurry on the inside. These have a place but are primarily designed for below ground use. If an exposed wall is soaking up rainwater and is cement pointed, lime will promote better drying from the external face. Try that first. Oh, do make sure that you tell these builder that the hydrated lime they get down the merchants is not the lime we are talking about. Use specialist limes from dedicated suppliers such as Womersley Associates of Heckmondwyke. Mark Womersley is a gold mine of information and if they buy the stuff from him – he’ll holed their hand with good practical advice. Thanks for all your advice. Everything you have said, confirms my worst fears. The 1960s/70s has a lot to answer for when it comes to damage to old buildings. Here in France they use cement for EVERYTHING. Historic buildibings are covered in the stuff. Tragic. You would think they would have caught on by now, that these old buildings are being irreparably damaged. Just waiting for them to cover their famous cash cow Carcassone in it! Our charming demeure19th century house is on a canal and that has not escaped the vandalism of concrete on the facade. The lime mortaring we had done on the back has small fissures in it. Devil’s own job to make sure that anybody who claims to be competent working with it, really is competent. Too late to save the front facade as drilling off the concrete would cause too much damage, I fear. I’m glad the post wwas useful for you. France is home to some of th efinest quyakity natural lime materials so it really is a shame that locals are not using it. Great article Bryan. Very well written and informative. I started my working career as a bricklayer/stone mason and we generally used lime mortars more often than sand/cement mortars. Then as you rightly say there was a big push towards the sand/cement mortars. Unfortunately we did not know the long term effects of using such mortar. Thankfully we are now far better educated and whilst we can not undo the past we can certainly ensure that in the future our building are restored a lot more sympathetically. Great read. Thank you. I’m currently removing several layers of thick white masonry paint from the inside wall of our 1740’s barn conversion. Only to be met by what appears now to be the dreaded concrete pointing. It’s very hard stuff, I’m using an industrial compressor with a needle gun and whilst it makes easy work of the stone it has a hard time taking the paint off the mortar. I had already decided the pointing simply had to go and that’s before I began reading up about the horrors of concrete as oppose to lime mortar. So now I’m looking at the the remaining unpainted walls and figuring that al the concrete pointing needs to go on them too. So what grade of mortar should be used on the internal wall? Nhl 2 or 3 or ?? No doubt I’ll look at the outside of the building tomorrow and be confronted by yet more concrete but that’s something to sort in the future. The job in hand is to sort the inside first. if you are applying lime pointing to internal walls you can use ‘fat lime’ with no set or a very feeble hydraulic lime – say NHL 1. You do need to balance the benefit of removing the cement internally. The stone is not getting rained on so the freeze/thaw I mention won’t apply. if you can replace it without damaging the stone that is fine. However, if lots of stone is damaged by removing the cement, why not concentrate on the external faces and perhaps leave the internal cement as a good compromise? Thank you for getting in touch, I’m glad you liked the post. I have a 1940’s bungalow that was built with solid walls using brick and lime mortar pointing. The pointing is now in need of repair or replacing as its crumbling in quite a few areas. Would it matter if the lime mortar was ground out and then replaced with cement mortar? The builder who has quoted for the work has said it wouldn’t cause any problems but I wasnt sure if it would cause any damp issues? 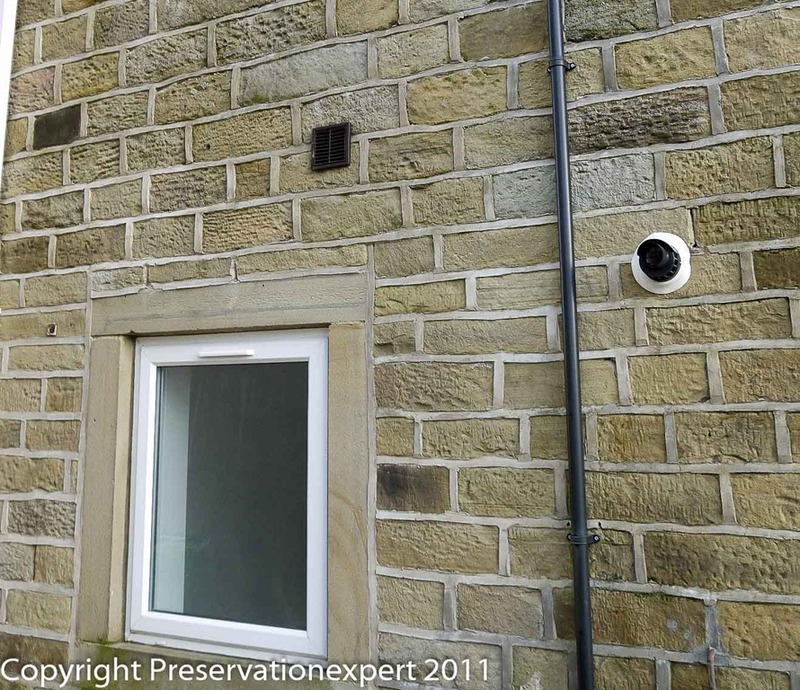 There is never ever a justification for replacing lime based external pointing with cement – don’t do it.